Sometimes things seem to happen for a reason. A few posts ago, I contemplated abandoning this project, thinking that I should be applying for a teaching position instead of spending time learning Amharic. Jan thankfully talked me down from that particular ledge. Nevertheless, I halfheartedly applied for a job, and even though I did not ultimately get summoned to deliver a demo lesson, I spent time preparing one just in case. I was told the lesson needed to relate to African independence. Perfect. What a great opportunity to learn why Ethiopia has never been colonized. That opportunity quickly took me to the Battle of Adwa. This is the story of a world turned upside down. On the first of March, 1896, not far from the Ethiopian town of Adwa, an African army won a spectacular victory over a European army. Africans had defeated Europeans before—at Isandlwana, for example—but these proved to be mere setbacks in the otherwise inexorable conquests. Ethiopian victory over Italy at the battle of Adwa was decisive: it brought an Italian war of conquest to an end. In an age of relentless European expansion, Ethiopia alone had successfully defended its independence. It turns out that the Stanford History Education Group already has a decent lesson plan on the Battle of Adwa, centering on comparative historiography. Examining an event from different perspectives is certainly good teaching practice, and I thought it might be even more interesting to look at Ethiopian and Italian representations of the battle in both art and music. 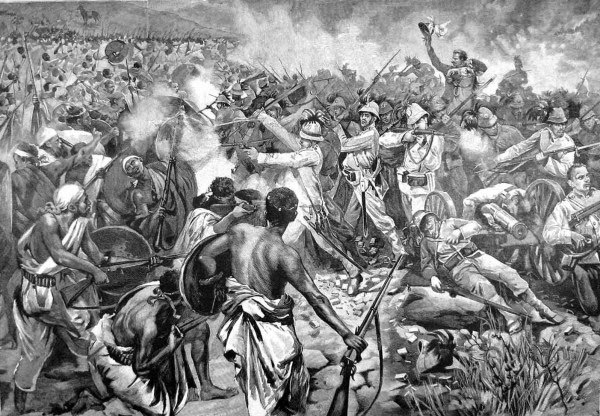 An oil painting of the Battle of Adwa done by a monk around 1970. The askari in the center with the red hat and brown skin looks directly at us. St. George, the patron saint of Ethiopia, always leads the Ethiopian army. He even throws spears. 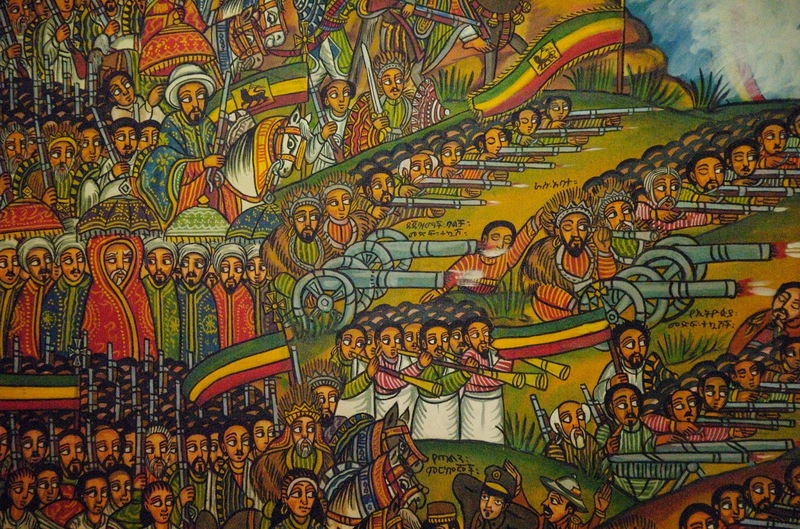 Detail of the Ethiopian army. An Italian soldier is captured at the bottom. The battle from an Italian perspective. There are also many songs sung about the Battle of Adwa. Ejigayehu "Gigi" Shibabaw sings a hauntingly beautiful one. Here's a well-known folk song about the battle from the 1999 documentary ADWA by Ethiopian director Haile Gerima. Lulit told me she remembers hearing this song as a kid, but she never really considered the words until I asked her to write them out for me. ቸበለው ("Chebelo"), which could be the name of the song, means something like "gallop on." My favorite lyric is በደም ይፈትፈት (sixth line). In translation, the enemy (mentioned in the previous line) is "drenched in blood." But the meaning is so much richer (i.e. gory and graphic) in Amharic. "Fetfet" is the name of a dish in which the injera is chopped up into little bits and mixed with sauce. So the enemy is not just drenched in blood, he is chopped up beyond recognition, mixed with blood, and metaphorically consumed. Ghastly. I asked Anemo and his friend Yoyo to sing the song with me. They would be the chorus and supply the response to each line. 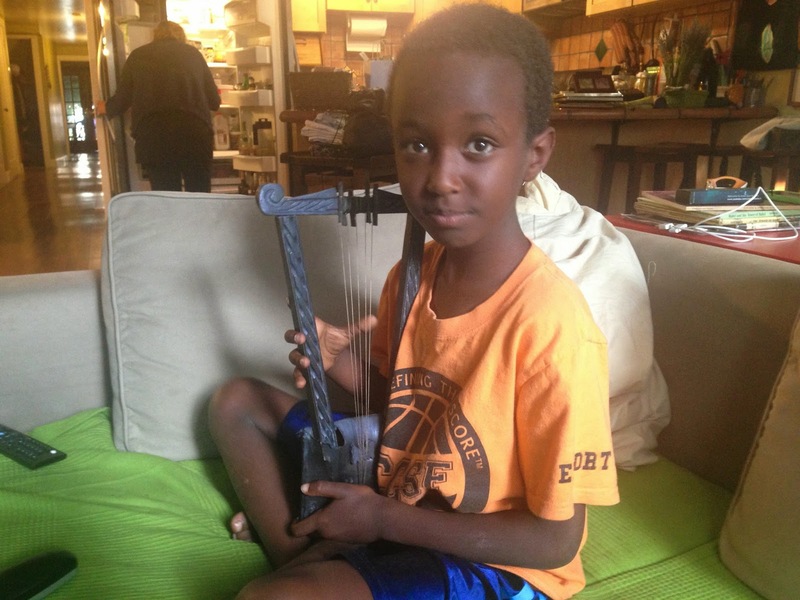 I don't own a krar (ከራር, an Ethiopian lyre), so I used my mandolin instead. Actually, we do have a non-functional, tourist version of the krar. I love how the kids act out the soldiers as they sing. And I'm glad they've been exposed to this important event in the history of Ethiopia. It's hard to overestimate the battle's significance. It is celebrated in a huge way every March 2nd in Ethiopia. It's why the African Union meets in Addis Ababa. And it's why the Rastafari movement was able to take root. Both Anemo and Yoyo, when they are older, will be proud to be connected in some way to this historic battle. Incidentally, I called this post "Adwa Fellows" partly because of the two young fellows who helped me sing the song about the battle. But I was also thinking about Ethiopia's similarity with the Odd Fellows. Bear with me. As I understand the Odd Fellows organization, it got its name long ago when fellows of smaller trades (an odd assortment, I suppose) banded together to form a guild of their own, achieving more economic power than they would have being separated. In significant ways, the Battle of Adwa united disparate populations into an Ethiopian nation for the first time, and that nation all of a sudden possessed power on the world stage. 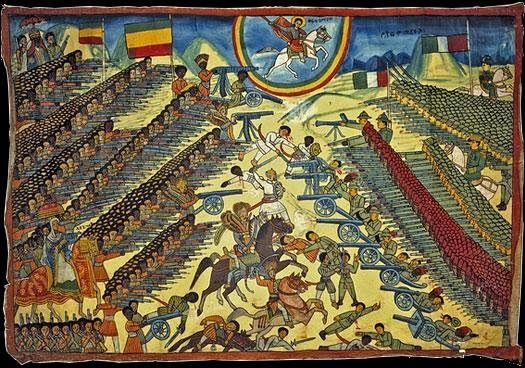 No ethnic group alone could have defeated the Italian army, but when Menelik II marched his diverse 100,000-member army over 500 miles north to Adwa, the Italians didn't stand a chance. As for me, I never stood a chance in getting that teaching position (though it would have been flattering to be offered the job without really trying.) Yet so much emerged from that thwarted opportunity. I hope I have been able to show some of it. The only thing that didn't emerge, however, was an Italian song about how Italy lost the Battle of Adwa!